Ask us for family rates! Enjoy the cooler night breeze and beautiful scenery at dusk! Subject to change depending on events, weather, road condition, etc. Arguably the most recognisable structure in Singapore, the SkyPark roof is shaped like a surfboard. Many celebrities have stayed here, including Katy Perry, Lady Gaga, Tiger Woods, Hugh Jackman, Taylor Swift, Kobe Bryant, Gong Li, Jason Mraz, F1 drivers, etc., too many to name! Bigger than the London Eye, the Singapore Flyer is the world’s largest observation wheel outside the US. It offers unparalleled views of the island 165m above ground. Right next to the Flyer is the Formula One Pit Building! F1 aficionados will go crazy as few tracks in the world allow you to walk right up to the garages and Start/Finish Line! Completed in 2011, the Marina Barrage works to alleviate flooding in low-lying areas of the city. It also dams the mouth of the Marina Channel to create Singapore’s first reservoir in the city area. On weekends, it is a popular getaway for families to picnic or fly kites. 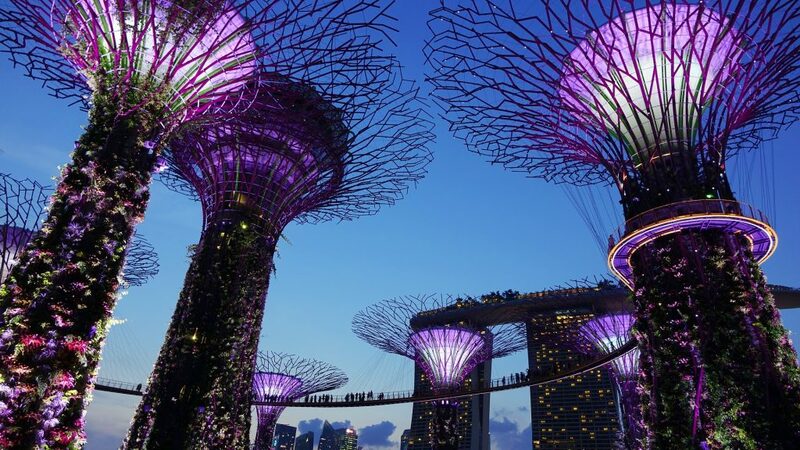 Spanning 250 acres on reclaimed land, the Gardens is Singapore’s strategy to create a ‘City in a Garden’ by enhancing the greenery and flora in the area. We will ride the perimeter on our tour so you can take in the magnificence and size of the Gardens. Formerly warehouses for goods trading along the Singapore River, the only businesses you’ll find here are restaurants, clubs and bars. This is where the tourists and locals come to party! The Esplanade is Singapore’s world-class performing arts theatre and concert hall. Or affectionately known as ‘durian’ to locals! 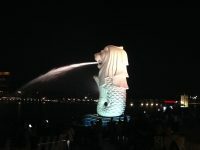 The Merlion is a mythical creature with the head of a lion and the body of a fish, used as a tourism mascot and national personification of Singapore. Originally a fort built in 1829 against sea attacks, the main building was built in 1928 and used as the Post Office until 1970s. The Tax Dept took over until 1995. Fullerton Hotel opened in 2001. This is the business heartbeat of Singapore. Surrounded by modem glass skyscrapers, offices of the world’s major companies, financial institutions can be found here. A modern architecture marvel completed in 2014, the Singapore National Stadium seats 55,000 and features a retractable roof. Get up close and personal on our night tour and see it in all its splendour! Let’s Go reserves the right to amend the route depending on real-time conditions (events/road-closure/government rules/safety/weather/etc.). 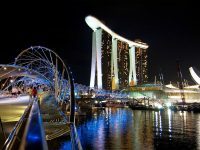 If you think the Marina Bay is beautiful by day, wait till the sun sets! 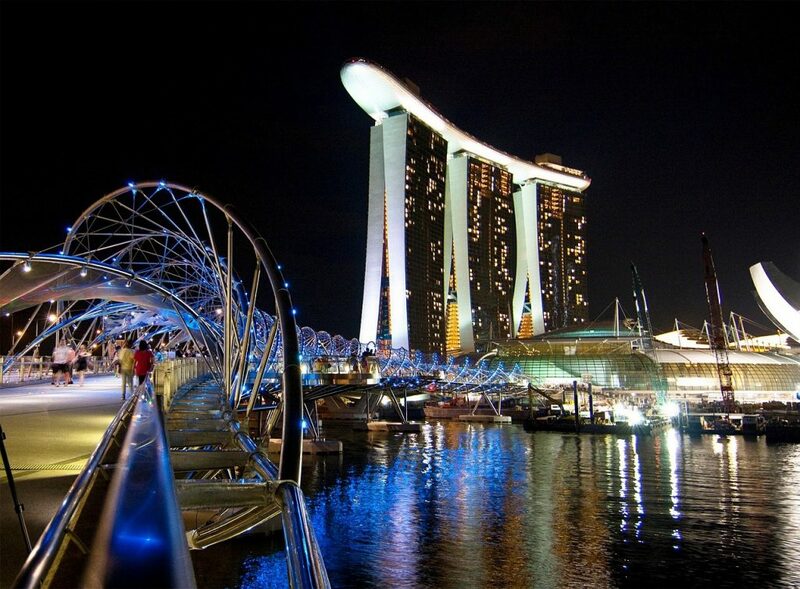 Get ready to be awed on our Marina Bay Night Tour! From the Let’s Go shop, get on your bikes (with safety lights of course) and follow your local guide as he navigates the riverfront promenade. 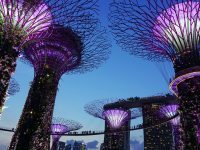 We’ll find peace and tranquillity at the Gardens by the Bay. 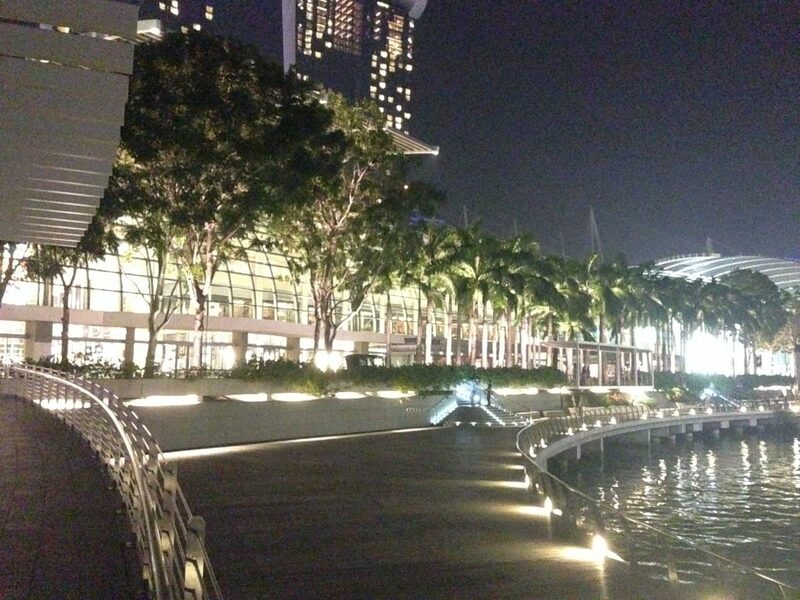 Let the SuperTrees tower over you and learn how the Marina Barrage keeps floods at bay. Feel a high tide coming on? Your caring guide will stop for a toilet dash here! For an adrenalin rush, we cycle towards the Singapore Flyer and the Formula One Pit Building. If we’re lucky, we’ll catch a live music performance just outside the Esplanade. Don’t forget to ask your guide about the floating football pitch too! 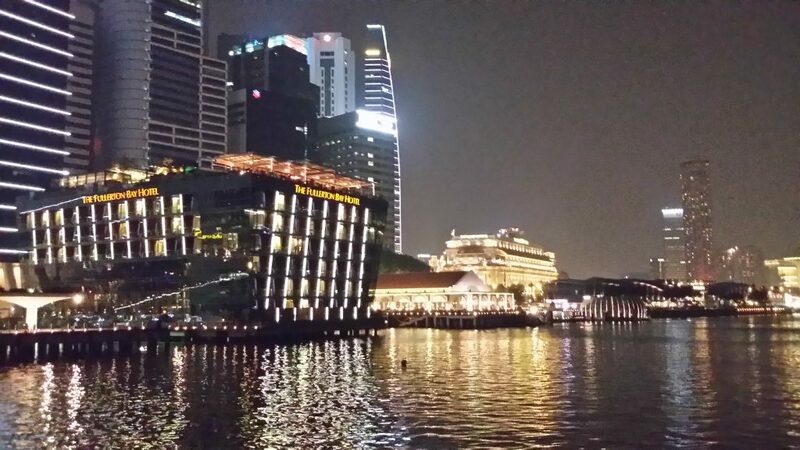 We’ll ride to a part of the business district where trade first started in Singapore over 200 years ago. Marvel at the lovingly-conserved shop houses, hotels and pier; and maybe join in the revelry taking place after your tour! As we head back to the Let’s Go shop, feel the cool breeze along the Kallang River towards the iconic National Stadium. 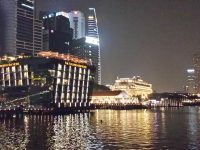 Along the way, you will see tranquil scenery and some of the costliest waterfront homes in Singapore. Use the online booking form on the right. Bookings must be made at least 48 hours before the scheduled start. Do NOT walk-in to our shop. We are NOT at the shop when we are riding with guests or there is no booking for the day. We restrict to 7 riders (except family/friends) per group, so book early to avoid disappointment. Be assured of our fair Change/Cancellation policy (read further below). We accept major credit cards via Stripe, a secure online payment service. Payment must be made for your booking to be valid. Be assured of our fair Change/Cancellation Policy (see below). You will receive an instant acknowledgement of your booking and payment. We will then check our schedule. If the date/time is available, we confirm your booking in a separate email. Email us immediately stating your NAME and BOOKING DATE/TIME. CHANGE: You may change your booking date/time. However if you give us less than 48 hours notice, you will not be entitled to any refund should you subsequently cancel. CANCELLATION: You will receive a refund if we receive your email at least 48 hours before the start. No refund will be given for less than 48 hours’ notice and if you arrive late and the group has departed. In the unlikely event that Let’s Go cancels, you will be given the option of an alternative date/time or a full refund. We STRONGLY RECOMMEND you buy Travel insurance for your trip to Singapore. Please ensure that it covers leisure cycling. 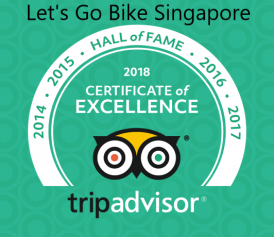 By booking, you (and anyone you book for) agree that Let’s Go Bike Singapore is not liable for any loss/damage, injury, illness, accident, fatality, etc. that may occur during the ride. Our routes have been carefully planned for maximum safety. We cycle mainly on alleyways, quiet streets and pavements. However in a big city like Singapore it will be unavoidable for us to cross the main road to get to another quiet street. Attempting to race, cycling faster than the Guide, etc. NOTE: No Refunds are provided for any of the above. Before departure you will attend a safety briefing and you MUST follow your Guide’s instructions at all times. IMPORTANT - NO NIGHT TOUR in SEPTEMBER. If booking a tour starting in <48hrs, call/Whatsapp +65 90044332 first to check availability! Please be specific; some hotels may have more than 1 location. 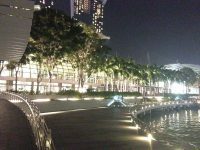 Copyright © 2019 - Let's Go Tour Singapore Pte Ltd - All Rights Reserved.